After 18 consecutive years of sharing Cedar Creek Treehouse with the public, we have decided to take a much-needed break and will not be accepting bookings for overnight stays or tours during the 2018 season. This break will enable us to concentrate on some other creative projects which include a Cedar Creek Treehouse video documentary as well as do remodeling and maintenance. If you have been one of our guests over the years and would like to share some memories or stories of your visit for consideration on the documentary, please send a letter (with any photos you'd like to include) to Bill Compher, P.O. Box 204, Ashford, WA 98304. In the meantime, we will continue to post our website for folks to enjoy worldwide. Our site includes a generation of guest comments, media accolades, and awesome photo galleries. 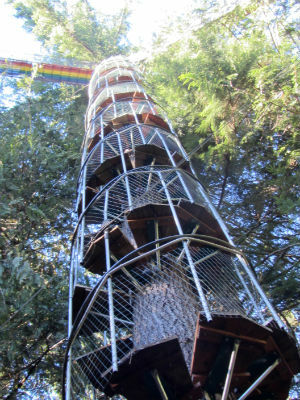 If you are considering building a treehouse of your own, we are offering our services as consultants, so please contact us by mail and be sure to include a contact phone number along with a brief description of your ideas. As you will find by reading the guest comments, people thank us for sharing and following through with our dreams. We'd like to encourage you to do the same! For those of you who planned to visit us this year, we sincerely apologize for any inconvenience this might cause. We hope you'll continue to stay in touch with us in the future. Keep the dream alive! 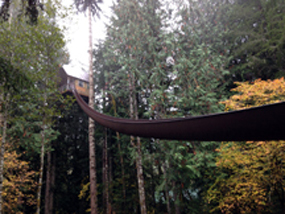 --" One of the World's Best Five Treehouses"